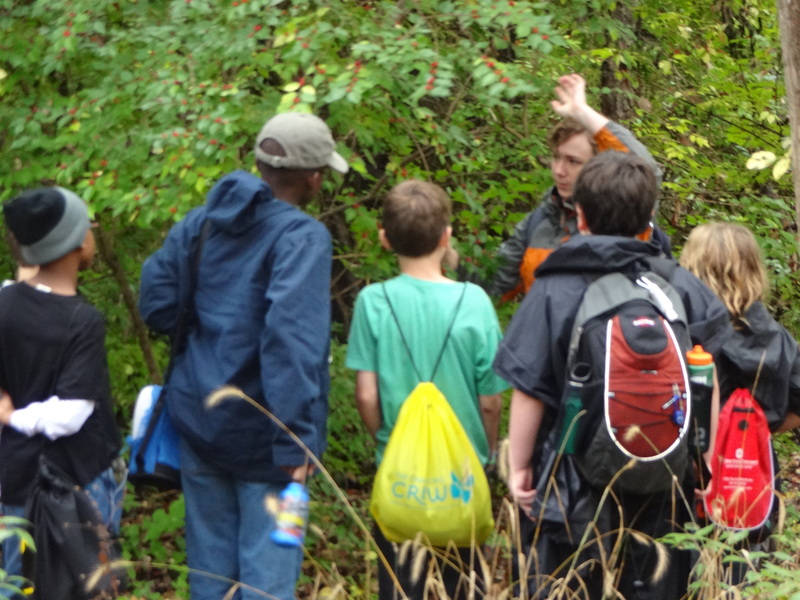 An OEC naturalist teaches 5th graders about bush honeysuckle as an invasive species. Photo by Linda Fuselier. The Biodiversity, Invasive Species, and Forest Restoration project is engaging groups from the Yellow Springs Senior Center, Antioch College, and grade schools from across the region in western Ohio in forest restoration at the Glen Heleh Outdoor Education Center (OEC). Last year, adults at the Yellow Springs Senior Center propagated plants native to the OEC during two workshops offered prior to the inception to the SENCER-ISE grant. These workshops were funded by the Llewellyn Foundation and became the basis for the work now being done in the SENCER-ISE project. Last fall, Antioch College students planted over 300 of the propagated native plants in the demonstration restoration area at the OEC. This first planting included spicebush, shagbark hickory, zig-zag goldenrod, bluestem goldenrod, heartleaf aster, bottlebrush grass, Greys sedge, tick trefoil. 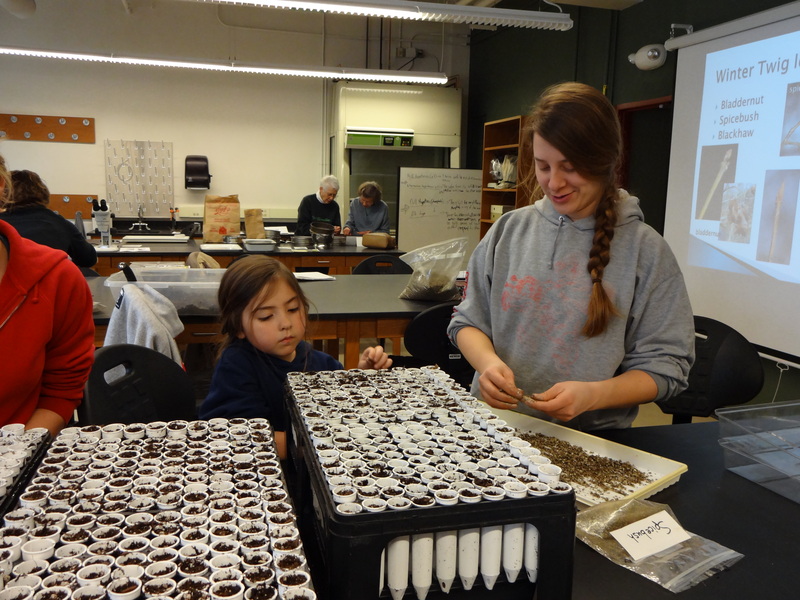 Kelly and Katie Quigley participate in a native seed propagation workshop. Photo by Linda Fuselier. The cycle is continuing with fifth and sixth grade students enrolled in the Outdoor School at the OEC. The students come from different schools across the region, many there on scholarship, to spend 3-4 days at the OEC studying various topics related to the environment and forest ecology. Last fall, students in the Forest Ecology lesson collected thousands of spicebush seeds for propagation, which students of the Environmental Problem Solving lesion will be planting this winter. 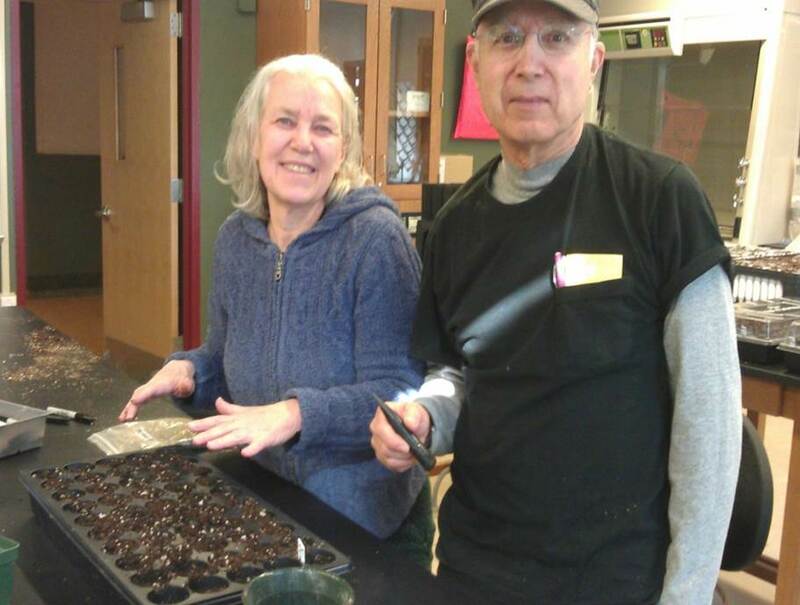 Corinne and Daniel Pelzl propagate plants in a workshop funded by the Llewellyn Foundation. Photo by Linda Fuselier. 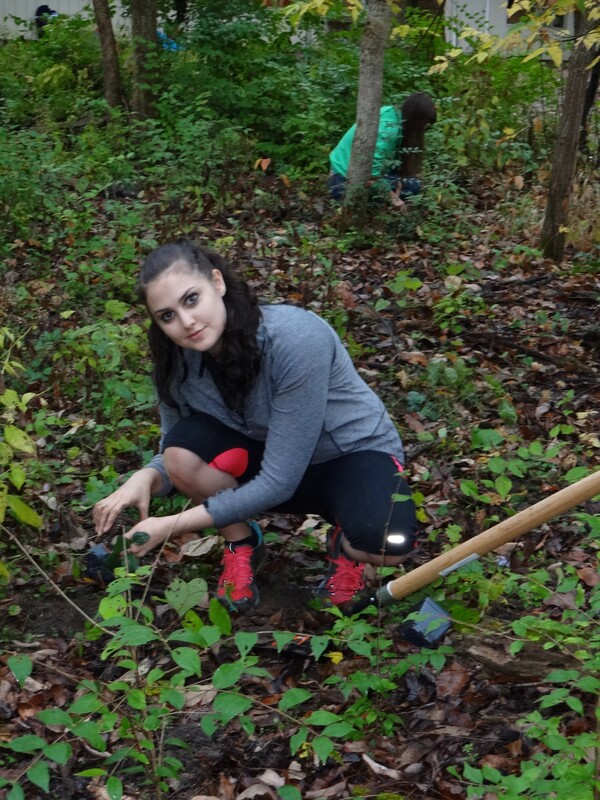 Antioch student, Sarah Goldstein, installs native plants in a restoration area in Glen Helen. Photo by Linda Fuselier. Over 80 community members participated in honeysuckle removal at Glen Helen and the work continues with field crews made up of land managers and students. In spring term, Plant Ecology students will work more directly with honeysuckle removal to create plots for their research projects. They will examine the survival of the native plantings relative to biotic and abiotic features of the habitats. This spring term, Environmental Science students will also become “assistant naturalists” in the workshops. To gain an understanding of formal science education, the work done at the OEC, and become experts on a particular native plant of their choice, students have been visiting the OEC and going on Naturalists hikes with grade school students and naturalists. The Biodiversity, Invasive Species, and Forest Restoration project has several goals, including the restoration of biodiversity in Glen Helen, improved understanding on the parts of students and community members of the basic principles of ecology related to biodiversity and invasive species through hands-on intergenerational interactions, and the increase of strong community connections. Continued monitoring of the demonstration restoration area at the OEC, participants’ self-reported attitudes toward forest restoration, and formative and summative evaluation to track understanding of subject matter will be utilized in assessing the overall success of the program. 1-7  Arthur et al. 2012. Plant Ecology 213:1571-1582. Cipollini et al. 2008. American Midland Naturalist 160:117- 128. Cipollini et al 2009. Invasive Plant Science management 2:45-54. McKinney and Goodell. 2010. Biological Invasions 12:2751-2763. Bauer et al. 2012. Plant Ecology 213:19-7-1916. Watling et al. 2011. Biological Conservation 144:2597-2601. Allan et al. 2010. PNAS 107: 18523-18527. Posted in Antioch College & the Glen Helen Outdoor Education Center, Partnerships.